With the sofa set Chicago you enjoy the comfort of a big sectional sofa. At the same time, you stay flexible. The division into a 3 and 2 seater offers you many possibilities to set up the individual elements. Each component of the sofa set is an eye-catcher in its own way. This is ensured by the modern design in two colours. The height of the headrests can be adjusted individually. In addition, spacious storage compartments with stylish LED lighting are available in every element of the Chicago sofa set. For each seat you can order an electric relax function under "Related Products", so you can relax your legs after a hard working day. We only use high-quality materials for the Chicago sofa set. The spring core padding under the surface ensures particularly high seating comfort. You do not have to worry about annoying wrinkles even after years of use. 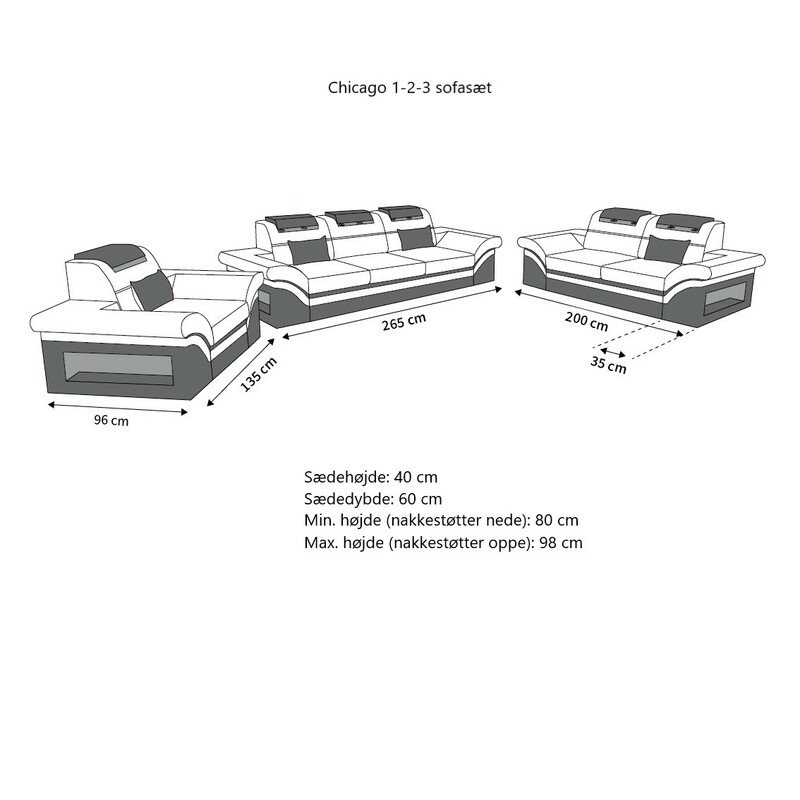 The sofa set Chicago is even available with an optional sleep function in the two-seater. So you have a couch and a guest bed in one! The sofa is layered with a high-quality polyether cold foam filling. The additional Bonell suspension prevents deformations that usually occur on the seat. This type of suspension also ensures the firmness of this piece of furniture. The solid frame is made of a robust, crack-resistant beech wood.